What's better than one wizard? But how, you ask, am I to get two whole wizards? Well, it's very simple. 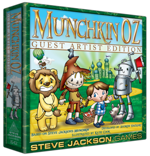 Grab Munchkin Oz Guest Artist Edition (from Amazon.com) and Moop's Monster Mashup, and shuffle the decks together to make one set. Bam. A game of two wizards. Who will do more crazy nonsense – the malevolent magician Moop or the hapless Wizard of Oz? It's that easy to combine these two recent Steve Jackson Games releases, and it's worth doing because the two mix so well – and not just because of that great wizard-versus-wizard action. For one thing, both games are full of absolutely cra-a-a-zy monsters. 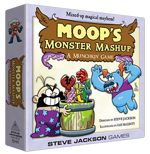 Moop's Monster Mashup is a game about magicking monsters into amalgam monsters, yet somehow it's Munchkin Oz Guest Artist Edition that features the Li-Mon-Eag (a lion/monkey/eagle). Second, Moop's and Oz both have Classes, but they're different Classes. Moop's are like classic Munchkin, and Oz has its own Class profile. That means you double your classy fun when you combine the games. Finally, Moop's has Races (again, the ones from classic Munchkin) . . . but Oz has Allies. So when you combine them, you have Classes, Races, and Allies, all in one game. The Races and Allies might be a little rarer than if you'd played each game on its own, so keep that in mind. Go forth now and shuffle. Because the world needs a scenario where an insane alchemic wizard overruns the land of Oz with his malformed creations almost as much as it needs honeybees*. * Fact-checker's note: Absolutely not. But it sounds amusing.